When you stay at La Quinta Inn & Suites Myrtle Beach Broadway Area in Myrtle Beach, you'll be in the business district, within a 5-minute drive of Ripley's Aquarium and Broadway at the Beach. 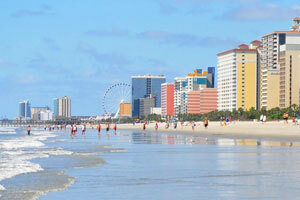 This hotel is 2.2 mi (3.5 km) from SkyWheel Myrtle Beach and 3.5 mi (5.7 km) from Family Kingdom Amusement Park. Make yourself at home in one of the 128 air-conditioned rooms featuring refrigerators and flat-screen televisions. Wired and wireless Internet access is complimentary, while video-game consoles and cable programming provide entertainment. Private bathrooms with shower/tub combinations feature complimentary toiletries and hair dryers. Conveniences include desks and microwaves, as well as phones with free local calls. Featured amenities include complimentary wired Internet access, a computer station, and express check-out. Planning an event in Myrtle Beach? This hotel has 500 square feet (46 square meters) of space consisting of conference space and a meeting room. Free self parking is available onsite. The preferred airport for La Quinta Inn & Suites Myrtle Beach Broadway Area is Myrtle Beach, SC (MYR). This property cannot accommodate trailer or truck parking. For more details, please contact the property using the information on the reservation confirmation received after booking.